Image: Alaister Russell/The Sunday Times Former president Jacob Zuma who will not be questioning witnesses at the state capture commission of inquiry sits next to his son Duduzane Zuma who wants to testify. This is file photo of Zuma sitting in court with his son who faces charges of culpable homicide. The same however cannot be said for Ajay and Rajesh Gupta. Zondo said whereas Ajay and Rajesh are outside the country and are not prepared to return‚ Zuma is currently in South Africa and has changed his previous decision not to avail himself to the commission as he is facing criminal charges on the same allegations. The Gupta brothers made a joint application to cross-examine Jonas‚ former ANC MP Vytjie Mentor and former GCIS boss Themba Maseko. The brothers said they would testify before the commission if it travelled to neutral location outside South Africa or via a video conference. “They [Ajay and Rajesh] say that they are presently in the United Arab Emirates‚ that they have no intention of ever returning to South Africa for any reason whatsoever‚ and that the reason why in effect is that they are afraid that the Hawks will arrest them as a result of what they call incompetence on the part of the Hawks‚ and that they may be charged by the National Prosecuting Authority‚ which they say is also incompetent‚” Zondo said‚ paraphrasing a supplementary affidavit the commission received from the brothers. 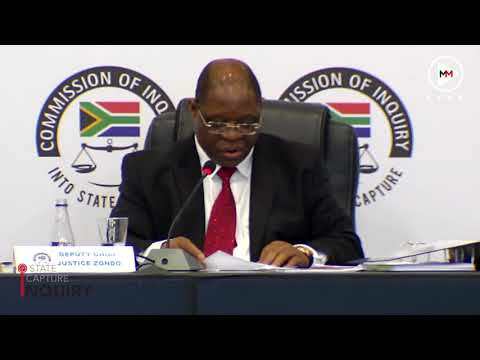 Zondo said the commission sees no reason to give the Gupta family “special treatment”. “As long as they are not prepared to personally and physically appear before the commission within the borders of South Africa‚ their application cannot be granted - but once they are in the borders of South Africa and are prepared to appear before the commission‚ I would have no difficulty in granting them permission to cross-examine‚" he said.